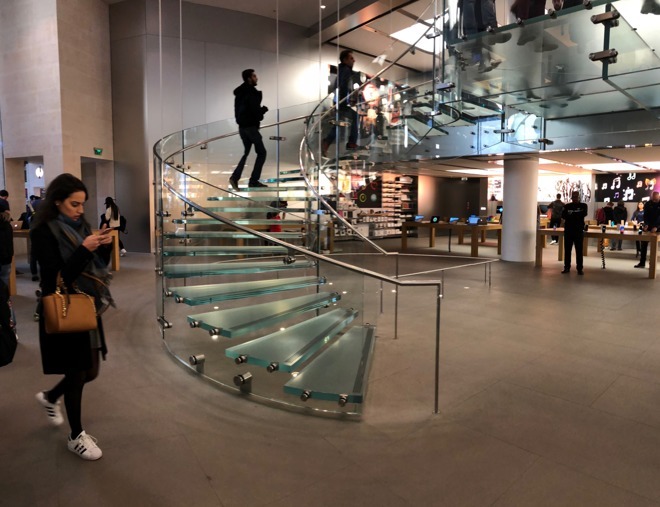 As Apple more recently embarked upon its massive modern expansion at Apple Park, pundits crafted a narrative claiming the company was fated to suffer from an 'arrogant construction hubris' and ultimately fail. There's certainly no sign of that supposed "Curse of the Edifice Complex" today, a few years later as Apple expands even further beyond Apple Park with surrounding buildings--including its monumentally lavish Visitors Center in Cupertino--and the nearby Apple Campus 3. The future outlook for Apple appears to have always been pretty wrong. The same kind of handwringing over Apple Park didn't occur over thirty years ago when the company was completing its first major campus back in 1993, just prior to a period of actual uncertainty and upheaval that really did result in a sideways period of crisis for Apple, known as the "Beleaguerment." To better understand some of the reasons why pundit advice and prognostication are so frequently misguided, take a look at the Old Apple during its first major campus project--in the context of what was happening at the company (versus what outsiders imagined was occurring, based on a superficial understanding of the market)--and consider what's different this time around. Apple's first major campus project in Northern California, known as 1 Infinite Loop, had just finishing completion in 1993 at the tail end of what had been commonly called (at the time) Apple's Golden Age: the pinnacle of its then highly-regarded Macintosh business that was just approaching its ten year anniversary (not unlike today's iPhone). The Macintosh-centric Apple had pioneered the development of advanced concepts including QuickTime digital video editing, voice synthesis and recognition, ultra-fast desktop computer hardware, new hyperlinked worlds with explorable nodes of virtual reality and the promise of a new generation of mobile Newton personal digital assistants. Across the 80s, Apple had achieved a pattern of distantly outperforming the collective mainstream of commodity copycat cloners in the industry by seeking to achieve something much greater than just incremental hardware advancement. While almost entirely forgotten after its fall in the mid-90s, Apple was commonly described at the time as having entered a Golden Age, a period of time where everything it delivered was impressive and exciting and desirable. 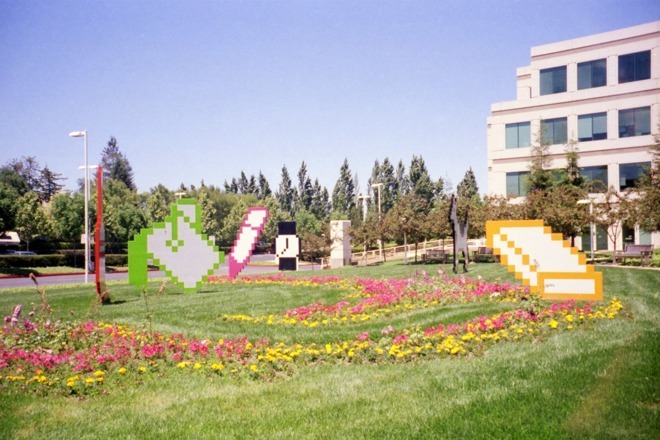 The new headquarters of 1 Infinite Loop reflected that Golden Age optimism while figuratively planting a nostalgic homage to representations of how it got there in its campus Sculpture Garden: a feature depicting cartoonish, low-resolution Mac icons sprouting from the lawn. The Apple of the early 90s could easily be mistaken for today's Google. Anyone who lived through the 1990s, however, will no doubt recall a different descriptive phrase attached to the company. By the mid to late 90s its was virtually impossible to read anything about "Apple Computer, Inc." without a specific introductory adjective that was, at the same time, wistful, disparaging, infantilizing and dismissive. The company was, and always was, referred to as the beleaguered Apple Computer. Despite suffering the consequences of both internal issues of its own making and outside problems beyond its control, Apple wasn't so much branded as being incompetent or victimized as it was just Beleaguered, as if it were inherently fated to always be chained to a hopeless dream and unachievable utopia that the company could envision and articulate but not instantiate in a viable, sustainable, commercially significant form. But Apple's problems weren't really a romantic curse. There were solid, rational reasons why the company began drifting sideways, even if much of the media lacked any understanding of this--or even knew that things were headed in a bad direction at all. Across the decade of the 1990s, Apple had defined airy visions of the future--from its Knowledge Navigator demonstration to the nearly magical Newton Message Pad; it had defined the outer realms of possibility in computers by developing software powerful enough to anticipate the needs of non-technical artists with its intuitive Mac user interface, and then promised to allow them to author multimedia--including the first non-linear digital video editing OS-level platform for personal computers with QuickTime (a futurist technology that appeared for Macs while commodity PCs were still struggling to play back simple audio). The company also delivered major hardware-based Mac upgrades enabling advanced AudioVisual capabilities using Digital Signal Processors from AT&T and later RISC-based PowerPC chips in its partnership with IBM and Motorola, allowing Apple's computers to digitally ingest, edit and output video from a camcorder and to play or record CD quality audio right out of the box. However, as the 90s dragged on Apple's consistent inability to actually deliver upon what it was promising at a price mainstream users would pay set it up for real-world failure. At the same time, the Mac maker began running into intense competition from generic DOS PCs. Apple had been struggling with its own development plans for Copland (intended to be a modern new Mac operating system), was fighting to finish its Newton OS tablet software and had grown increasingly distracted with a series of other moonshots and side projects (including the Mac-based Pippin games console) that various teams engineers were inventing within their personal fiefdoms inside Apple's Advanced Technology Group and other think-tank silos funded by the revenues from the Mac's Golden Age. It had also launched a separate new mobile chip design for the Newton Message Pad known as ARM, with partners Acorn and VLSI. There was a lot going on outside of the Apple's core Mac business, but none of it was making enough money to sustain itself. Across the company's first five years at 1 Infinite Loop, Apple appeared to be caught in the vortex of a swirling drain, losing its customers and market share to cheaper commodity PC makers while being forced to frantically delay and ultimately cancel failed initiatives such as QuickDraw GX and OpenDoc after they had wasted the time and resources of its third-party developers. After a period of constant beleaguerment that seemed to last for a generation (but really only stretched from 1994-1998, shorter than either Microsoft's Windows-Zune mobile meltdown a decade later, or Google's increasingly bleak implosion of hardware attempts from Motorola to Nest to Nexus and Pixel today, two decades later), Apple began to emerge anew under the returned leadership of Steve Jobs, who slashed away failed experiments and underperforming business segments to focus on ones that customers would want and could afford and which could sustain Apple itself. Could an Apple again lose its Golden Age? Other companies, including Microsoft, only watched from afar as the Old Apple began rolling on its side. That allowed Microsoft's executives to blissfully preside over a series of ill considered and poorly planned and managed projects (such as rushing into the Zune music player hardware business and trying to start a music downloads business like Apple's, the KIN initiative (AKA "Pink") in to build a new kind of phone from scratch for the very challenging demographic of "young people," and an ambitious but poorly conceived and delivered Surface RT project to make PCs lighter, thinner and more mobile using ARM chips that couldn't run existing Windows software). Beyond those internal failings (including Microsoft's own Copland-like struggles with Vista, Windows 8, Windows Mobile and Windows 10), Microsoft also engaged in dramatically bad partnerships (such as its "two turkeys" phone program with Nokia) and acquisitions (subsequently buying Nokia, as well as aQuantive, for a total of $15 billion--with nothing remaining to show for either one apart from layoffs and losses). Everyone one of those missteps was worse than Apple's fall in the mid-90s. Microsoft had enjoyed a much more resplendent Golden Age than the Old Apple had, but then lost its key market position and relevance as the world shifted to mobile devices. For Microsoft, there was no return of its founder Bill Gates to put the company back together again. Microsoft wasn't the only company to fail to learn anything from Apple's mid 90s brush with death: Google today has been similarly spending similar billions on far-off ideas that are not materializing as real businesses. Like Microsoft, it also spent around $15 billion to acquire two massive businesses, Motorola and Nest, then failed to do anything productive with them as it fired thousands of workers and eventually sold off much of the remaining assets to China at a massive discount. Google similarly has grandiose ideas about the future of computing (satiated with advertising, of course) but has failed to deliver much more than a copy of Apple's original work. Many of the novel parts of Android rusted over and were replaced with iOS analogs (trackball pointers, keyboards, Wallet, open app markets, broad app permissions, etc). ChromeOS was envisioned as a PC web-based netbook but is now trying to morph into an iPad-like touchscreen tablet. Even Google's far off future OS strategy is abstractly named after a color (Fuscia), which not so subtly calls to mind the Blue and Pink cards Apple used while trying to lay out some deliverables for its System 7/Copland releases. Google has now been struggling to find any significant customer for ChromeOS nearly nine years after it was outlined as a strategy (2009), which calls to mind Apple's Newton under early 90s CEO John Sculley and Microsoft's Tablet PC initiatives under Gates in the 2000s. Rather than describing the failure of ChromeOS to find any traction anywhere apart from the very small, very unprofitable K-12 as being a Newton/Tablet PC type failure, today's tech journalists are largely portraying Google's struggling netbook platform as a problem for Apple, even though shipments of Chromebooks have had a minor impact on Apple's U.S. sales in K12 and no real impact at all on iPads among consumers, the enterprise, and in massive new emerging markets including China. In parallel, Google's self-branded hardware efforts have been a mess despite double-digit billions in acquisitions and investment. Google's Nexus offered low-priced devices that sold in disappointing quantities, much like Apple's own ill-fated attempt at low-end Performa Macs from 1992-1997. Google's subsequent Pixel products offered premium-priced devices that sold in disappointing quantities, much like Apple's Newton and fancy vanity projects like the company's TAM and translucent PowerMac Cube. Google is also today pursuing a dual OS strategy involving two entirely different architectures (JavaVM-based Android and its web-based ChromeOS), not dissimilar to Apple's Mac/Newton rift, or the problems Microsoft slogged through with DOS/Win95 vs NT, and again with the kernel disparity of Windows for PCs and Windows Mobile. In all three cases (Apple, Microsoft and Google), companies launching a series of wild, unrestrained moonshots while having multiple, competing platforms all vying for attention in the same space (while not actually selling much of anything) turned out to be a really bad strategy with terrible results. But our science experiment subjects here also show the effects of outside stimulus. There has been less criticism of Microsoft despite its massive loss of control over the future of technology, but absolutely none of Google (as least so far). A lack of criticism results in a lack of course-changing. Relentless criticism of Apple has greatly improved the trajectory of the company, as demonstrated by its corrections to iCloud, Maps and the App Store in response to media castigation. 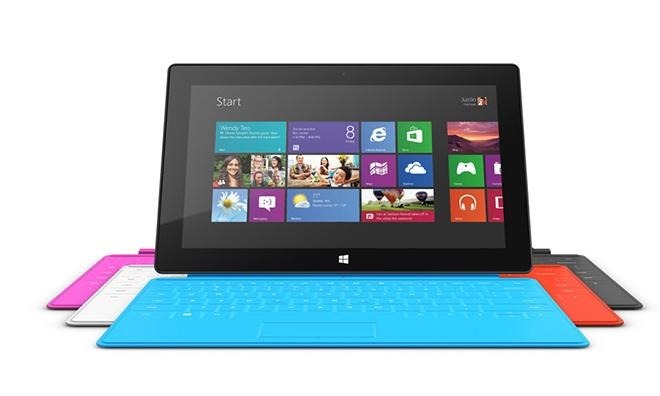 Tepid assurances by the media that Microsoft could reassume its monopoly control over mobile devices and take back tablets by simply copying elements of Apple's strategy cooed the company to sleep. Today Microsoft has zero phone business and its tablet and PC sales are a low-profit busywork distraction that--like Mac sales under the Beleaguerment or Google's Pixels--haven't grown across many years of trying. Today, Apple is focused on fewer products that sell in massive quantities at sustainable profits. The company's software updates have (and deliver upon) achievable, short-term goals, rather than charting out future, far away dreams or trying to deliver grandiose notions such as a voice-first ambient computing future or an advertising-based social surveillance network that people may not even want once they see what it really means. Apple's modern developer APIs are generally stable enough to rely upon, rather than being promises that don't ever fully materialize and are then thrown out once the focus changes. Yet Apple isn't praised as sitting on a Golden Age today. It's generally ridiculed by the media for not pursuing ambitiously entertaining public stories and moonshot ideas. Rather than declaring Apple's wildly successful recent history as a Golden Age, pundits have been giving their lethal applause to Microsoft (for delivering half of its "the cloud and devices" promises while its once dominate computing platforms stagnate or die off entirely) and Google (for its fun moonshots to nowhere--including blood sugar monitoring contacts that don't actually exist, its Andy Rubin robot initiatives that have very little real commercial value, its stabs at social networking that nobody cared about and its radical efforts to shift society and industry--from Wallet to Glass to Project ARA to Tango--an unbroken series of expensive projects that never went anywhere). Across the 2000s and early 2010s, Apple far exceeded the accomplishments of its previous Golden Age of the late 80s and early 90s--and did so while severely operationally constrained in its corporate office space. The new Millennium Apple, under Jobs, focused on a flexible, new eye-catching material he made more valuable than gold as he and his hand-selected team turned Apple around, as the next segment will examine.